Even the tiniest yard, porch or patio can be made truly special with a few strategic choices. Design magazines and home decorating catalogs tend to feature sprawling backyards with big wooden decks and room for everything from decorative fountains to artificial ponds. But few of us have that much outdoor space. Still, with a few strategic choices, you can create something truly special out of even the smallest yard or porch, says Los Angeles-based designer Brian Patrick Flynn. Here, he and two other design experts — small-space specialist Kyle Schuneman and landscape designer Chris Lambton — offer advice on the best furnishings, plants and decorating strategies for making the most of a small yard, modest deck or petite patio. “With a small outdoor space, I really like to think double duty,” says Schuneman, author of “The First Apartment Book: Cool Design for Small Spaces” (Potter Style, 2012). Look for seating that has hidden storage space inside and tall planters that add privacy. And choose items that can easily be moved, such as lightweight flowerpots or planters on wheels, says Lambton, host of the gardening design series “Going Yard” on HGTV. “It’s an easy DIY thing,” he says, to buy an assortment of inexpensive plastic pots and paint them to match your outdoor decor. If planters are lightweight or on wheels, you can move them to get proper sunlight at different times of day, and rearrange them if you’re entertaining guests and need more space. And, Lambton says, they can be moved inside to a sunny window or doorway when cold weather arrives. “The easiest way to make small outdoor spaces appear smaller is to fill them with lots of pieces,” says Flynn, founder of the design website decordemon.com. When arranging furniture, consider the view: If the home’s exterior is more attractive than the outdoor view, Flynn says, consider positioning seats so that you’ll face your home rather than looking away from it. All three designers say your choice of plants is especially important when space is limited. Choose plants with a purpose: “Lavender’s great,” Lambton says, because it’s attractive, easy to grow and deters bugs. Marigolds will also help keep insects away. Lambton also suggests putting up a trellis as a privacy wall, and planting it with colorful wisteria or climbing hydrangea. Or choose a tall holly or cypress plant in a large planter. “Holly will be green all year round,” he says, and can help transform an unappealing view. He also suggests using narrow planters to create “long, narrow, raised flower beds that go the length of the space.” They provide room for plants to grow, while also creating a ledge that’s “great for coffee cups or a casual lunch,” he says. 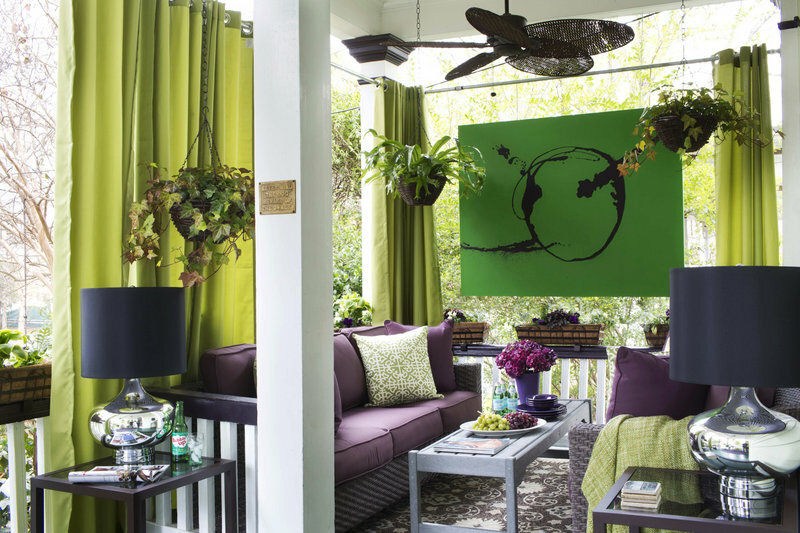 Flynn suggests playing up the height of your space by adding long outdoor curtains or hanging pendant lights. “I usually paint concrete slabs (on the floor) a bold color or an accent color carried out from an adjacent room,” Flynn says. “This helps the patio feel like an extension when you look out to it through a door. 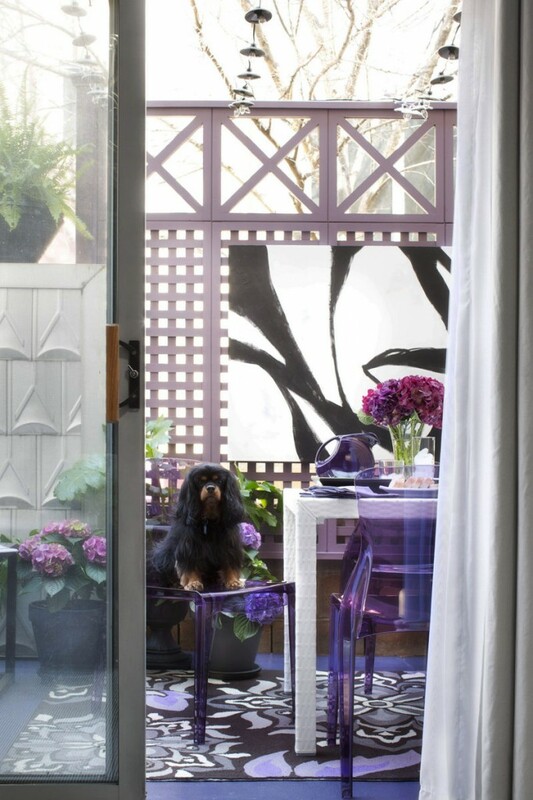 Flynn also suggests using outdoor curtains for a burst of color, and to block an unattractive view or hide items like electrical boxes and storage bins. And for a burst of natural color, Lambton suggests adding a small, tabletop fire pit for a golden glow at night. “Some are small enough, and they don’t put off a lot of heat,” he says. You can make any outdoor space more beautiful, Lambton says, with just a few hours of effort and a small investment.